Only an ardent disciple can truly understand what it means to consecrate the Lord, the Guru and the faith in the innermost realms of his heart. The most holy days of March 2019 witnessed the Pratistha Mahotsav of the simply awesome, jaw-droppingly majestic Raj Mandir and breathtakingly divine pratimaji of Shrimad Rajchandra in Sayla. 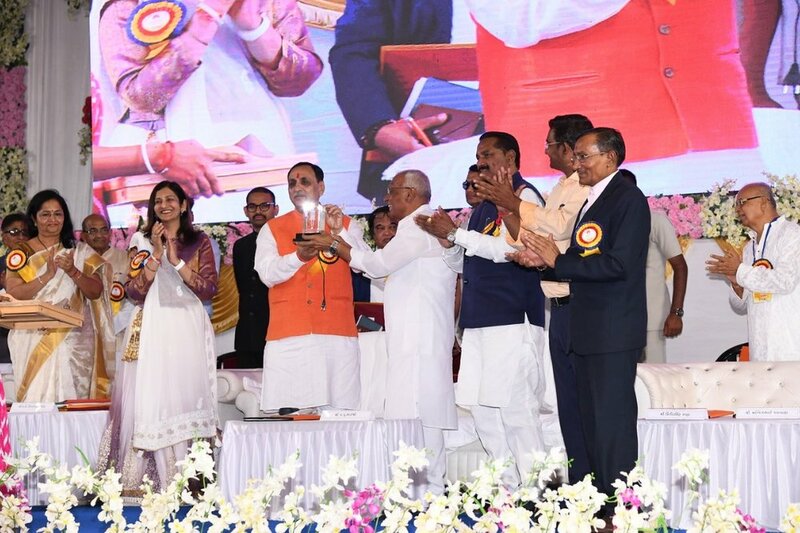 This much awaited program spanned over 7 days, was presided over by eminent heads of various ashrams, and infused thousands of disciples with overwhelming devotion. On the beautiful morning of 4th March, after morning meditation and nityakram, mumukshus participated in soulful bhakti and swadhyay. Pujya Bhaishree gave an insightful discourse on Updesh Chhaya 9. He made special mention of the devotion of the gopis for Shri Krishna. Even while going about their daily chores, their whole being was immersed in devotion for the Lord. Similar should be the devotion of every mumukshu aiming to reach their ultimate goal – enlightenment or samkit. 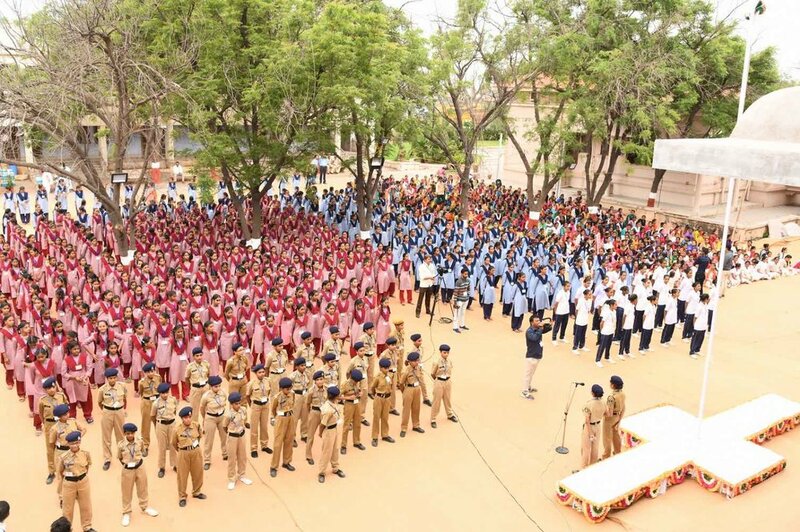 The Panch Kalyanak Pujan in the afternoon and audio-visual film – ‘Divya Jyoti no Amar Prakash’ in the evening, brought in the first devotion filled day of the 7-Day Pratistha Mahotsav. 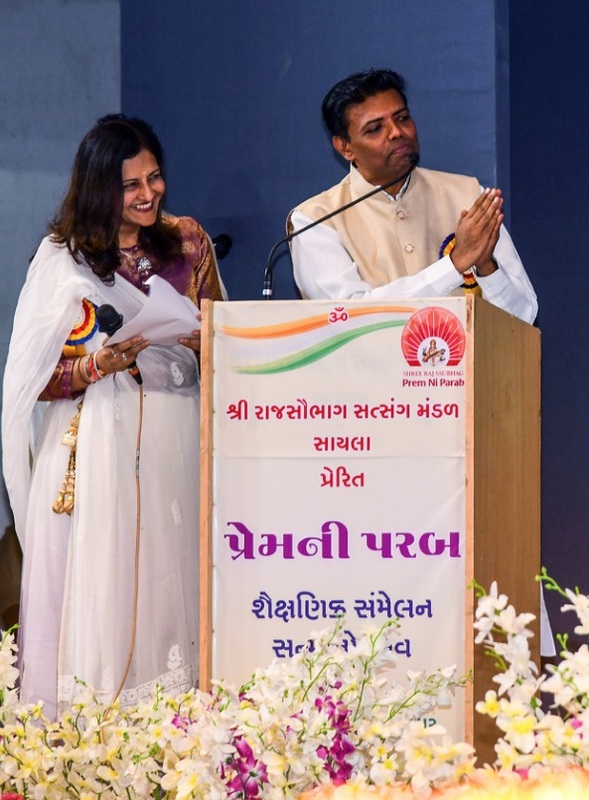 On the 5th of March, among the special programs were Atma Siddhi Pujan and transformation message delivered through comedy by well-known performer Shahbuddin Rathod. 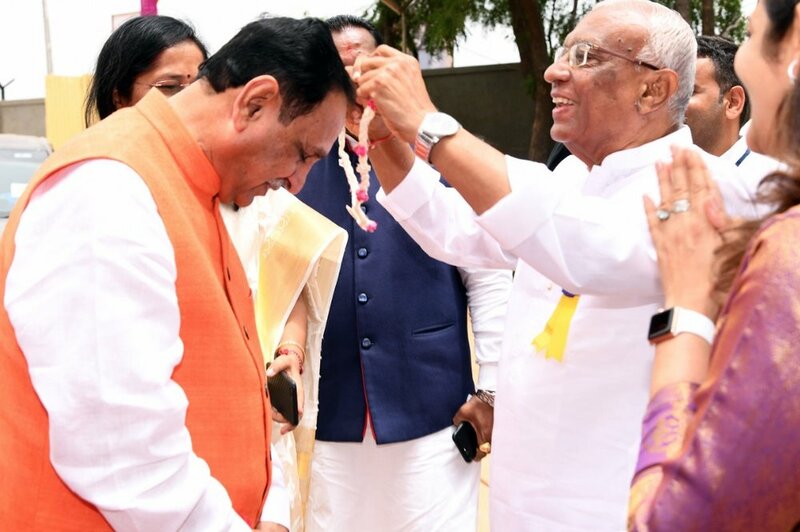 By some divine co-incidence Pujya Fulchandbhai Shastri, founder of Adhyatmik Sadhana Kendra in Umrala arrived in Sayla on the very day and time when the Atma Siddhi Pujan was being conducted. He graced the occasion with his presence, arriving in ashram in the morning hours, accompanied by other mumukshus. During the afternoon swadhyay, Pujya Bhaishree gave a discourse on Vachnamrutji letter 569. 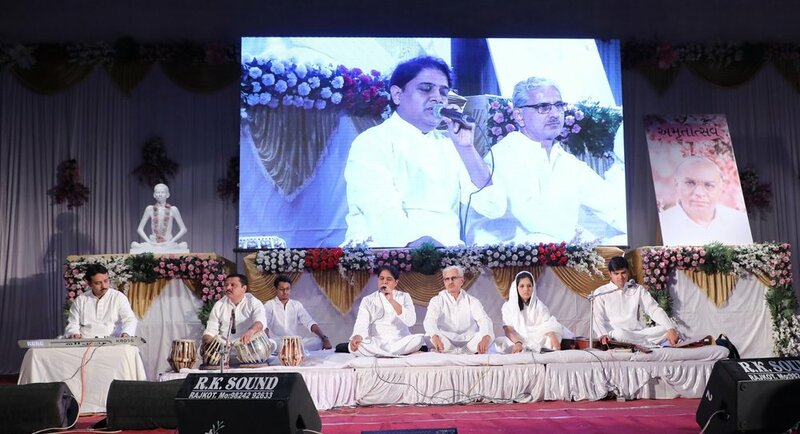 On the 6th of March, the entire day was filled with swadhyay, agna bhakti, meditation, collective recitation of the Atma Siddhi shastra and ultimately devotional bhakti by Shri Ashokji Pandey and his immensely talented troupe from Varanasi, which filled the Raj Mandir hall with melodious bhajans and lingering notes of musical instruments. 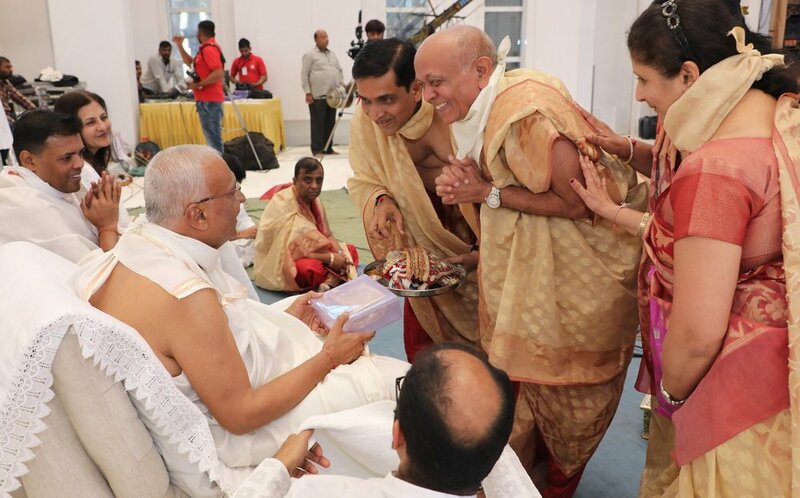 Parshwa Padmavati Pujan was conducted by the well known pujakaar – Shri Hiteshbhai, who explained the meaning of many shlokas which helped in fully engaging the participants during the entire 4-hour ceremony. With every consequent event matching up to the excellence of its predecessor; there remained one more cherry on the cake: a 35-minute dance performance by trained classical dancer-mumukshus from London, Nilpa and Naitika. 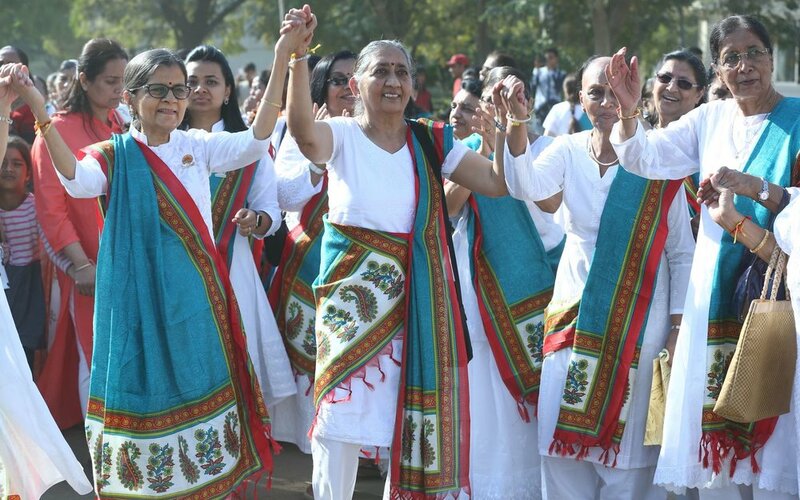 So emotively was the message conveyed in their performance on Shrimadji’s composition – ‘Bahu Punya Kera Punj Thi’, that the audience was held spell bound. 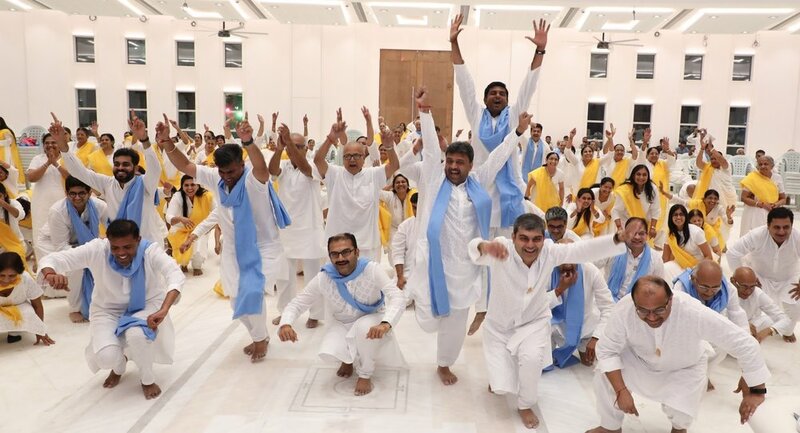 The entire moksh marg, the pitfalls on the way, the shelter provided by an enlightened master and value of this priceless human birth were explained through dance, drama, dialogue, music and emotions. Their perfectly coordinated steps along with the hand and eye movements were a delight to watch. On the auspicious day of 8th March (Fagun sud 2, birthday of Param Pujya Bapuji), after the ceremonial procession, was the Pratistha ceremony of Bhagwan Mahavir and the inauguration of 3-D images of the lineage of enlightened masters of Sayla. All the visiting dignitaries from different ashrams in India then gave their discourses and sent good wishes and blessings. Make your vision large; reach for the sky, reach for enlightenment, rather than groping for insignificant things like wealth, power, family ties etc. Expand your thoughts and discussions to ‘Who am I? Where have I come from? Whence forth my journey?’; rather than narrow, lowly thoughts about politics, food, women or government. Become large-hearted; inculcate qualities of brotherhood, forgiveness, understand the perspective of the other person. 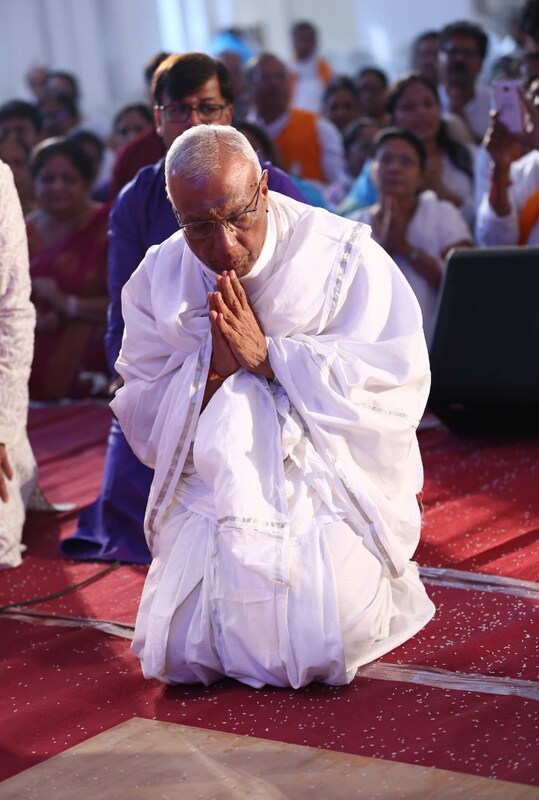 Pujya Gangjibhai said: “Always remain aware that you are the powerful soul. Every activity, every action must be done with awareness. The bhakti bhaav of every mumukshu that we have witnessed during this Pratistha reminded me of the incidence in Shrimadji’s life when mentioned to Laghuraj swami that in the entire day he was reminded of the satsang he partook in when he was the disciple of Bhagwan Mahavir. In the same way, all of you mumukshus must have inculcated this bhakti bhaav in your previous births, such that in this birth too, all of you are drenched with devotion. 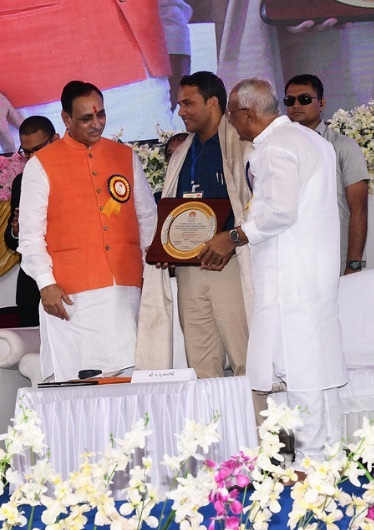 The ashram trustees and mumukshus expressed heartfelt gratitude and felicitated architect and interior designer Shri Devenbhai and civil engineer Shri Chandrantbhai Jasani and their entire team for their selfless service in the construction of the spectacular Raj Mandir. 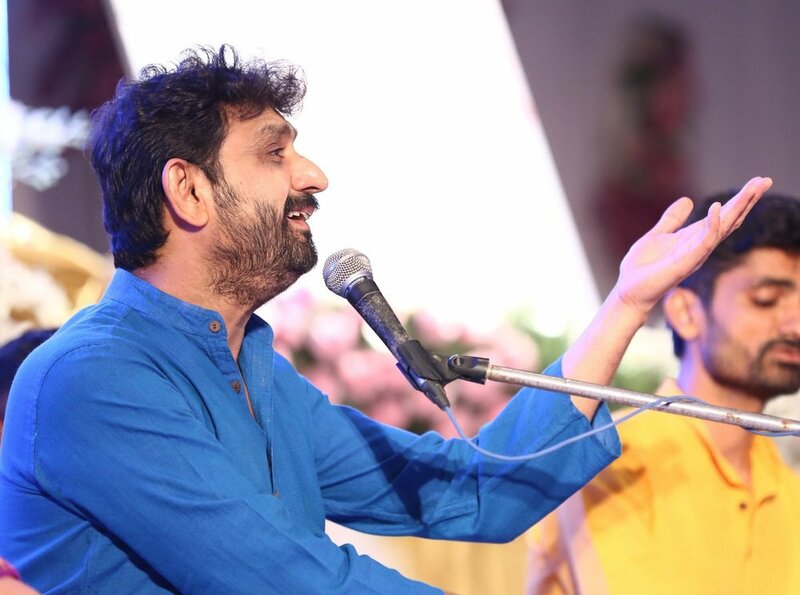 Shri Ashishbhai and his group immersed the audience in devotional bhakti towards the end of the evening. The Sattar Bhedi Puja was conducted from 6.45 am on the artificial turf outside the Raj Mandir. Mumukshus gathered for participating in the puja as well as changing the Dhaja (Jain flag over the temple). This ceremony is a veneration of the 5 holiest beings – Arihants, Siddhas, Acharyas, Upadhyays and Sadhus in the entire universe. At 10. 45 am, was the climax of the entire occasion – Pratistha of Shrimad Rajchandra’s pratimaji in the new Raj Mandir. To the uplifting music of bhajans and chants, disciples danced in gay abandon, deeply grateful to be part of this most holy event. 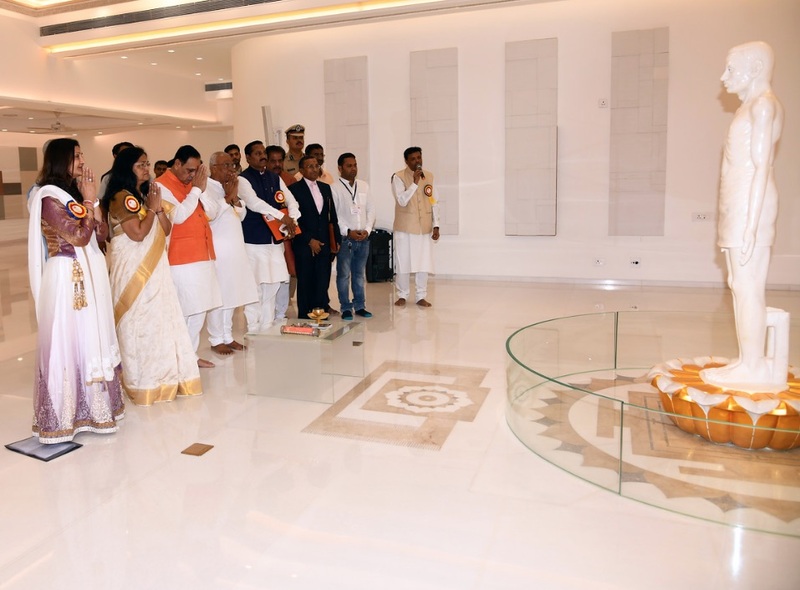 So breathtakingly beautiful and mesmerizing was the inauguration of the Pratimaji, that every eye turned moist and every heart overflowed with pure devotion. The nectar-clad image of Shrimadji seemed like the very replica of Bhagwan Mahavir in the Samvasaran. A deep silence descended in the auditorium filled with 2000 people and every soul was overwhelmed. Day 1 - Swadhyay & Bhakti - Shrimad Rajchandra Vachanamrut Updesh Chayya 9. Day 2: Swadhyay - Shrimad Rajchandra Vachanamrut Letter 569. Day 4 - Morning Swadhyay - Shrimad Rajchandra Vachanamrut Letter 469 explained by Param Pujya Bhaishree. Following swadhyay was the changing of the garlands ceremony in Kalyan Hall. Param Pujya Bhaishree, spiritual head of the Raj Saubhag Ashram, Sayla, has lovingly and masterfully guided disciples for 25 years as their guru. He also turned 75. Param Pujya Rakeshbhai (Bapaji) of Shrimad Rajchandra Mission Dharampur, Param Pujya Ben Prabhu of Shrimad Rajchandra Mission Delhi, Param Pujya Sarmishtaben, Param Pujya Gokulbhai and Shri Kurmapral Desai, Param Pujya Acharya Chandanaji, Pujya Sadhviji Sanghmitraji, Pujya Sadhviji Chatanaji and Pujya Sadhviji Vibhaji of Veerayatan graced the festivities which marked these two anniversaries. 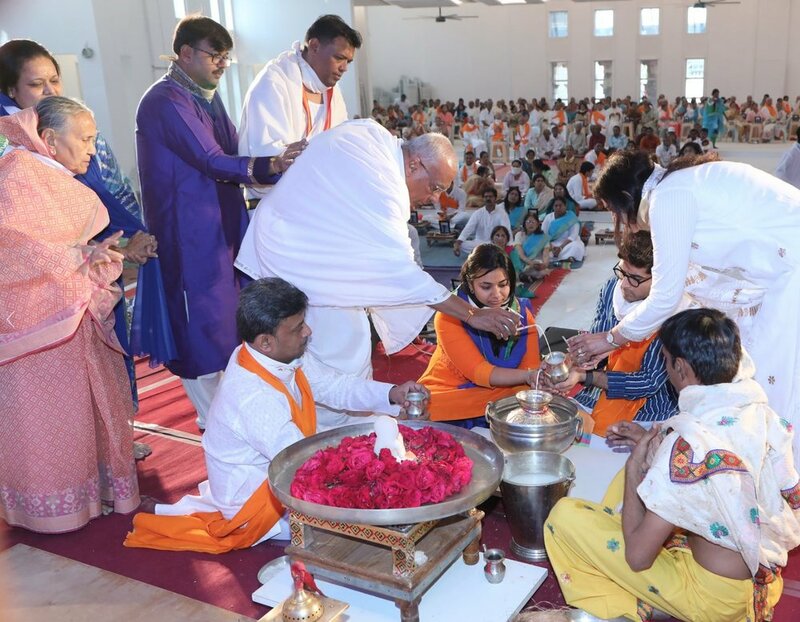 On the first of the five days, there was a wonderful and uplifting Sidhhachakra Pujan, followed in the evening by an inspiring session of Bhakti performed by the band called “Sparsha”, formed by followers of Shri Pappaji of Parli Ashram. 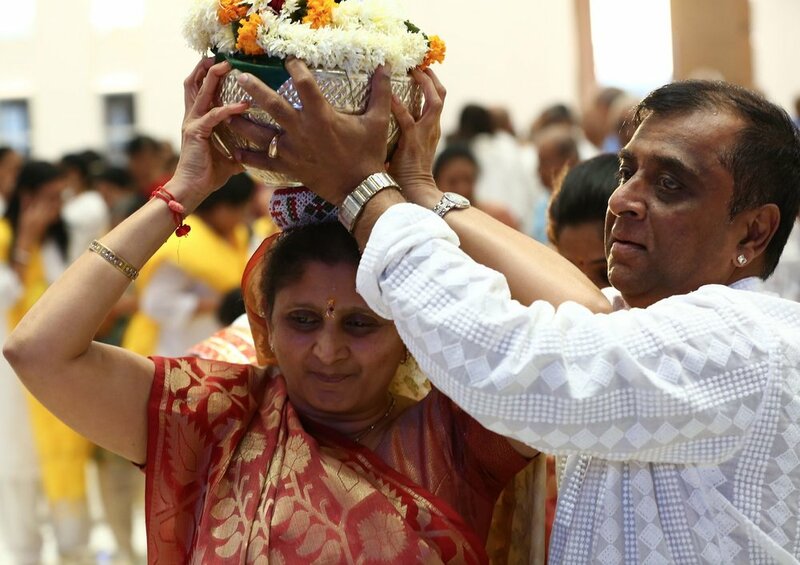 On the second day, a wonderful Gautam Swami Puja was performed, followed in the evening by Bhakti performed by the renowned Sachit Limye and his wife Ashitaben, followers of the Art of Living. Sadhviji Sanghmitraji also presented some glorious bhakti that evening. 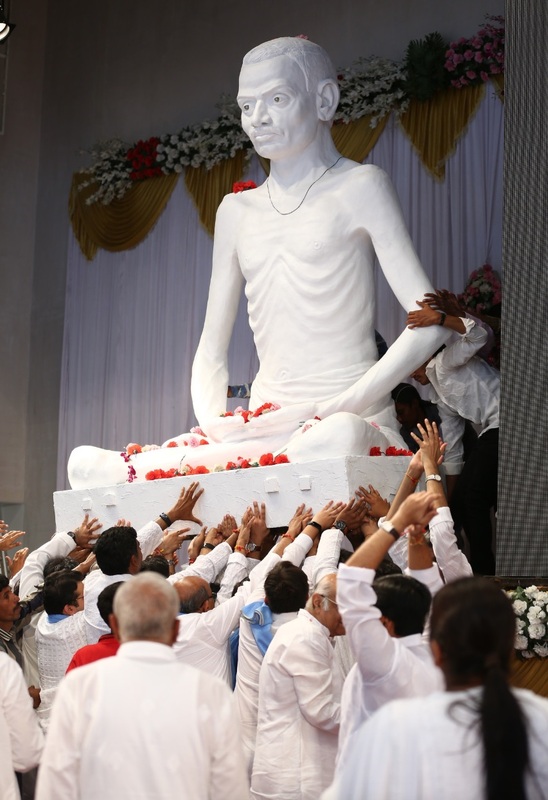 On the third day, the full moon of Kartik, the birth anniversary of Shrimad Rajchandra, there was a morning procession and installation of a plaster cast model of Shrimad installed in the nearly complete Raj Mandir Hall. Sanghmitraji shared half an hour or so of Bhakti that day. In the evening, Shrimad’s poem Mula Marg was presented in dance form and the innovative and moving play Tejovalay was performed. On the fourth day, Bhaishree’s birthday, there was the performance of a play on the life of Dadu Dayal and further dance presentation. 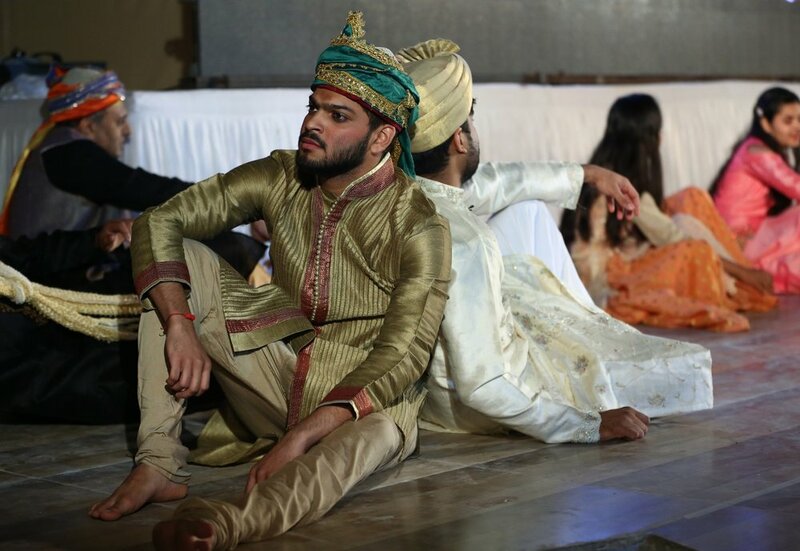 The performances of the 3rd and 4th evenings were by Raj Saubhag members. 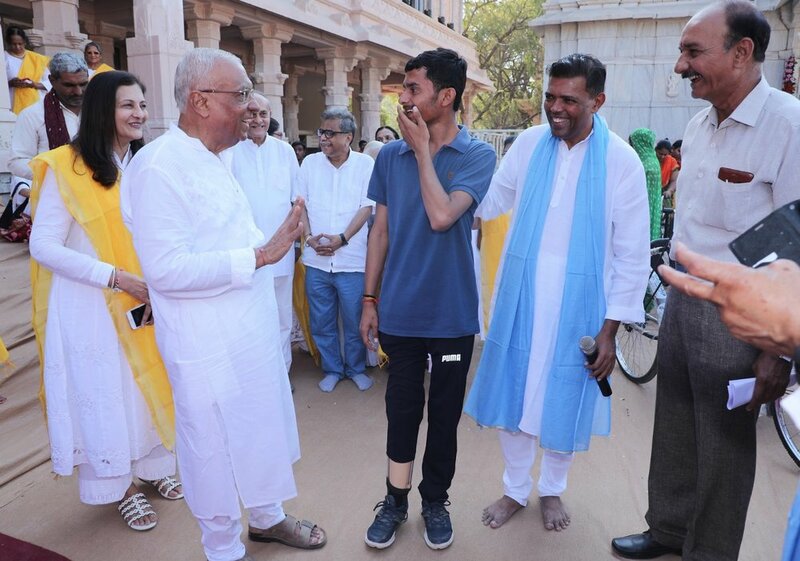 It was also wonderful to witness the tremendous teamwork, behind the scenes of so many Ashram members, a great sense of empowerment and dedication. A number of the visiting dignitaries and other guests remarked on this favourably.. Throughout the course of the 5 days, Bhaishree and the other saints and speakers gave inspiring swadhyays or expressions of their feelings. Param Pujya Bhaishree had visited Pujya Ben Prabhu at the Shrimad Rajchandra Mission in Delhi, during a Jatra in January 2015. Ben Prabhu has translated all of Shrimad’s poems into Hindi. She inspires introspection about our mental inclinations and thought processes, which can lead us to an inner focus. 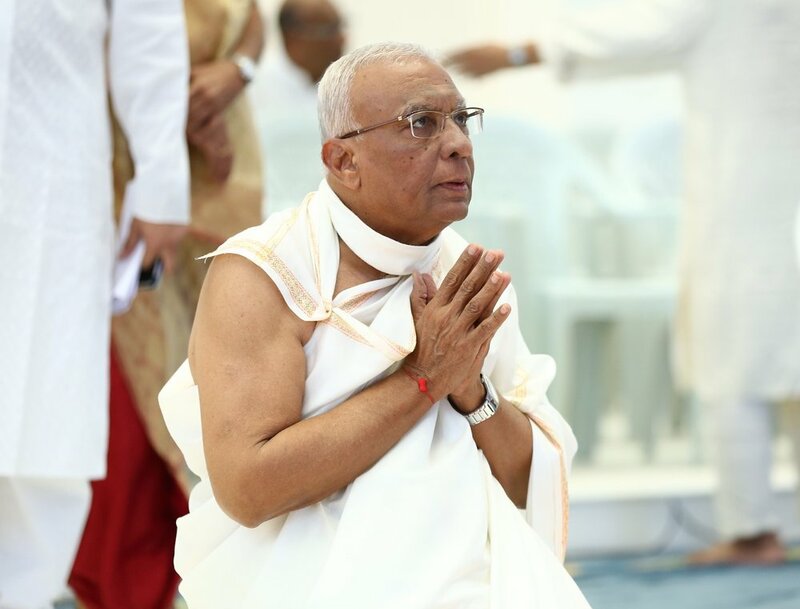 The thoughtful, devoted, disciplined, Ben Prabhu analysed various types of Bhakti, and explained how the eternal, unchanging soul can be seen in the midst of the the ever-changing world by means of devotion. Pujya Gokulbhai has often met Bhaishree at the Ashram and on various Jatras. A striver, a yogi, with vast scriptural knowledge, he has purified his life with reflection, meditation and penance. Focused on the Nishchay (absolute) point of view, he brings a strict and precise interpretation which often awakens the audience in a striking way. Gokulbhai described the soul as independent while karma bears its fruits, but that we surrender that independence by identifying and engaging with the fruits of karma. 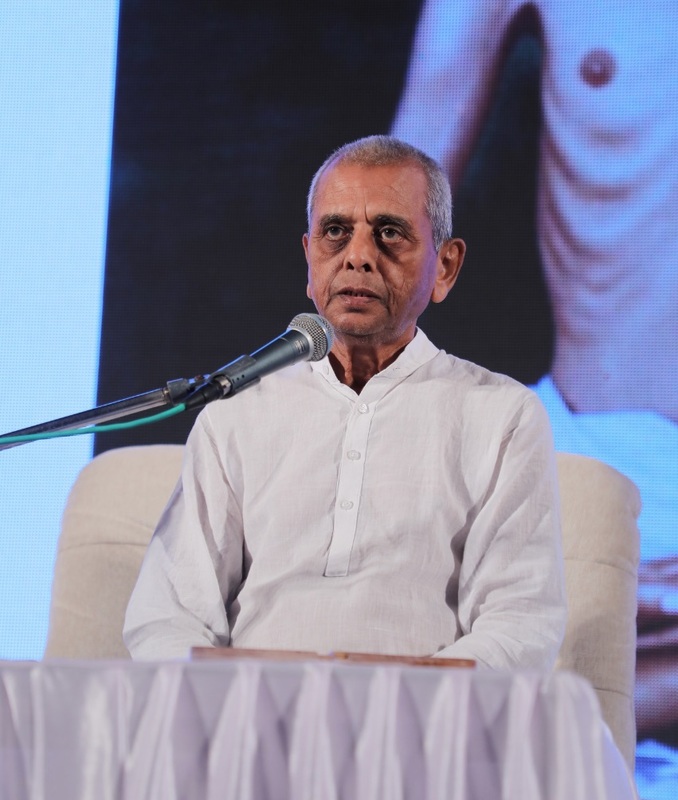 Pujya Rakeshbhai, founder of Shrimad Rajchandra Mission, Dharampur, has inspired a large number of youngsters in India and abroad, bringing them closer to a life of contemplation and purity. He fondly remembered Bapuji, to whom he was greatly attracted, and expressed the great impact on all of us of Saubhagbhai of Sayla, Shrimad’s soulmate. In his humorous and analytical style, he covered a wide variety of examples, and differentiated between suffering and pain, describing pain as the fruition of inauspicious karma, but suffering as self-inflicted, the result of negative reaction and feelings towards that pain. Unfortunately, Pujya Atmaandandji of Koba was not able to join us, but we were graced by the peaceful, motherly, spiritual prsence of Sarmishtaben, his spiritual and life partner, whoread out a message from Pujya Atmaandandji in a gentle and peaceful style. A recipient of the Padmashree, author, scholar and friend of the Ashram Kumarpalbhai Desai, has ancestral connection to the village of Sayla, and has long been associated with the Ashram. He spoke of attaining the vision to see the invisible by grace of the True Guru, and to rise above the dependence we have on external material things, adopting a much greater perspective. Acharyaji Chandanaji had first heard of the village Sayla in 1962, when she was in Rajkot, but had not been able to come here. Param Pujya Bapuji, the previous guru of Raj Saubhag Ashram had visited Veerayatan a number of times, and in January 2018, Param Pujya had visited Rajgir and stayed at Veerayatan with several hundred pilgrims. It was at this time, that he had personally invited Acharyaji, especially during these celebrations. Vikrambhai of Raj Saubhag Ashram had fondly called her Ma in Rajgir as well as in Sayla, likening her to Mother Teresa. 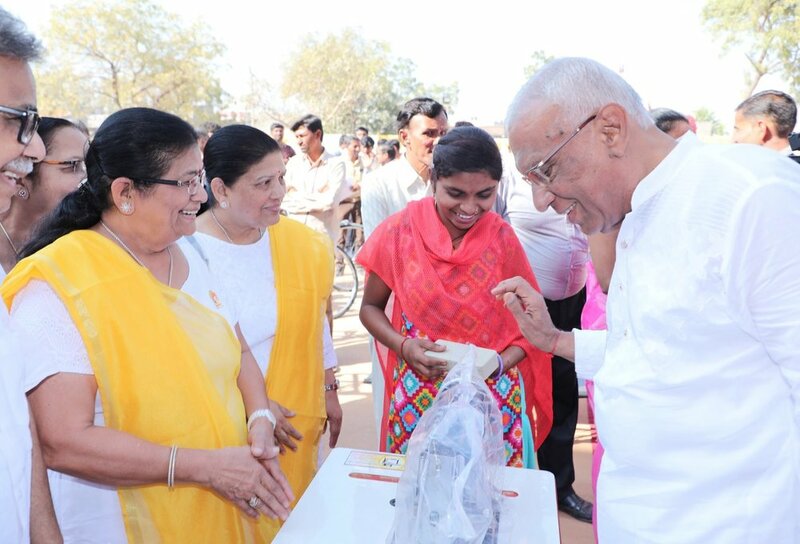 Acharyaji expressed her feeling of delight at being there. She said that she would direct anyone looking for heaven to come to Sayla. In her own sweet and loving style, Acharyaji explained that Bhakti cannot exist where the notion of “I” persists, that such Bhakti can be attained at the shelter of a True Guru. 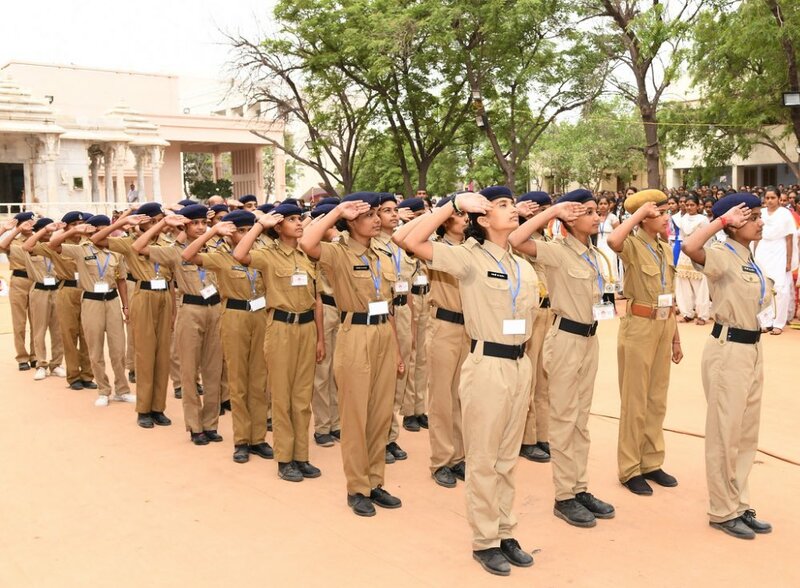 She expressed her revolutionary ideas of service (seva) as striving (sadhana) and that God can be seen (and served) in those less fortunate than ourselves. She was keen for Veerayatan and Raj Saubhag to cooperate, meet and work together. Among the Sadhvijis accompanying her Pujya Sanghmitraji sang bhajans in her supremely melodious voice. Needless to say, she set the mood each time she took the mike. Param Pujya Bhaishree was fecilitated for his many years of continuous service to seekers and to those suffering materially. He was noted for his tremendously tolerant, open-hearted nature. This could be seen by the wide variety of viewpoints shared during the celebrations. On various days, he took swadhyay on verse 129 of Atma Siddhi, describing the True Guru as the highest doctor, capable of curing the disease of delusion by compassionately prescribing contemplation and meditation in his agna. On some of the days, the audience was privileged to hear Bhaishree speaking personally about his own experiences on the path. 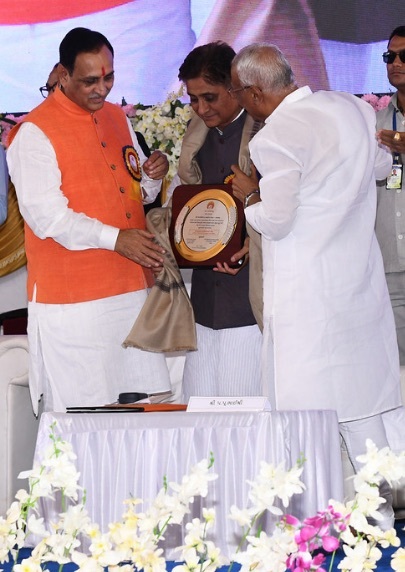 He expressed much gratitude to Param Pujya Bapuji, his guru, for opening his eyes to the beauty and depth of the message of Bhagwan Mahavir, and to the teachings of Shrimad Rajchandra. 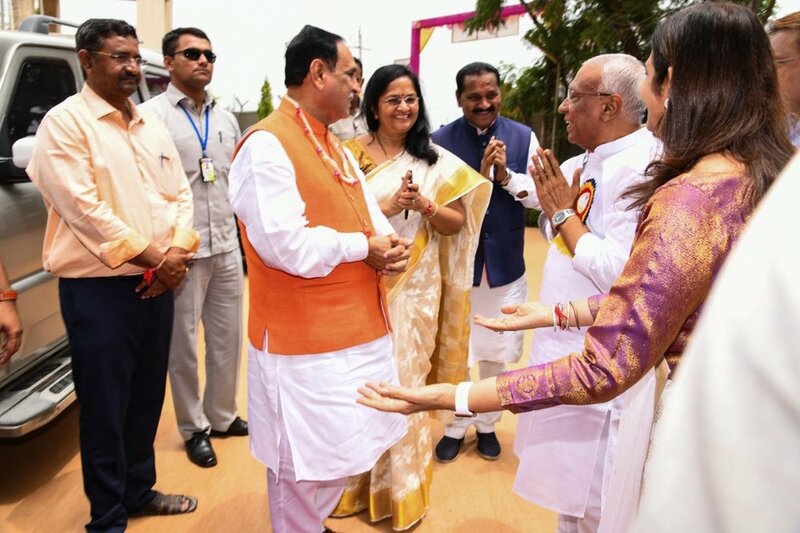 He opened Bhaishree’s eyes to Saubhagbhai of Sayla, Shimad’s soulmate: to understand Shrimad, one has to understand Saubhagbhai, and Bhaishree was grateful to connect to the living tradition and lineage of Saubhagbhai in Sayla. Bhaishree also spoke fondly of the late, Param Pujya Gurumaa, who was a leading disciple of Bapuji and anointed at the same time as Bhaishree. He spoke about Bapuji’s fondness for her striving and character. How she progressed swiftly and silently. 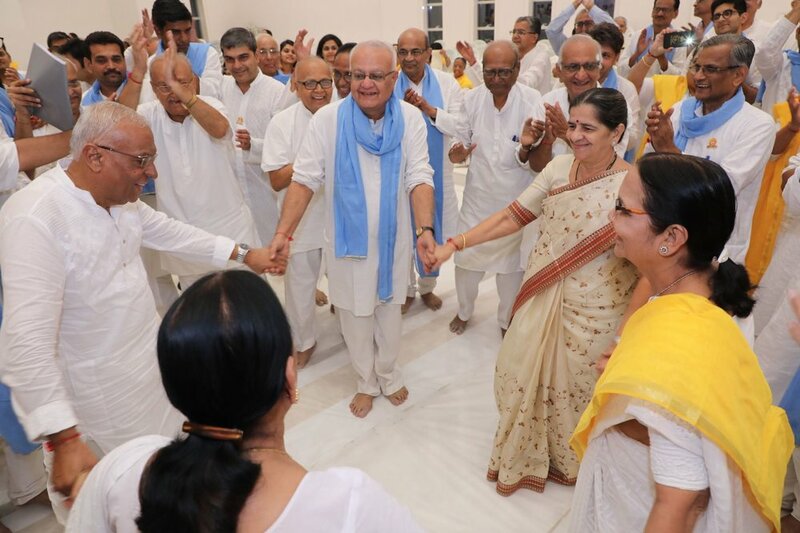 The five days of celebration allowed Raj Saubhag Ashram and its members to come closer to the love, care, service, devotion, spirituality, and scholarship of the noble guests, forming deeper connection, gaining inspiration. Ultimately, we learned yet more about our beloved Bhaishree, through the praise and respect accorded to him, through the experiences of other saints and scholars, and through the precious opportunity to observe him closely, deeply equanimous and tolerant throughout the five days of celebration. Let the divinity of the enlightened saints grace the world! Bhakti evening with performance by the renowned Sachit Limye and his wife Ashitaben, followers of the Art of Living as well Sadhviji Sanghmitraji soulful bhakti. Morning procession and installation of a plaster cast model of Shrimad in the nearly complete Raj Mandir Hall. Evening cultural programme included: Shrimad’s poem Mula Marg was presented in dance form by Nilpa and Naytika Shah, and the innovative, moving play ‘Tejovalay’ was also performed. 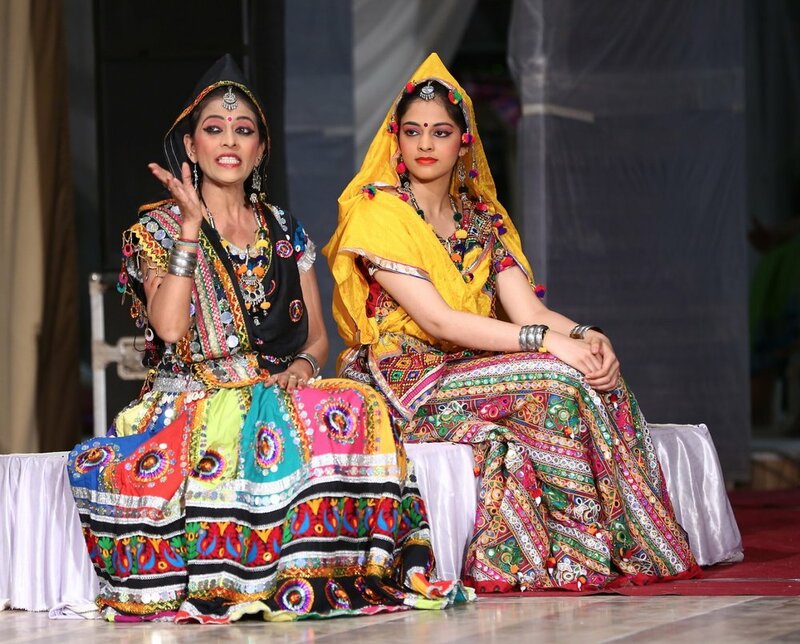 Evening cultural programme included the film presentation of Bhaishree’s spiritual journey: ‘Niranjan, In love with Truth’, the performance of a play on the life of Dadu Dayal, and further dance presentation. On the occasion of Param Krupaludev Shrimad Rajchandra’s Birth Anniversary, the sabha held in Sayla Ashram had swadhyays by Pujya Ben Prabhu, Acharya Chanadanashriji and Param Pujya Bhaishree. On the occasion of Param Krupaludev Shrimad Rajchandra’s Birth Anniversary, the sabha held in Sayla Ashram had swadhyays by Pujya Ben Prabhu and Acharya Chanadanashriji. On the occasion of Param Pujya Bhaishree’s 75th Birthday Amrutotsav, the sabha held in Sayla Ashram had swadhyays by Pujya Ben Prabhu, Param Pujya Gokulbhai, Param Pujya Rakeshbhai (Bapaji), Shree Kumarpal Desai, Acharya Chandanashriji and Param Pujya Bhaishree. On the occasion of Param Pujya Bhaishree’s 75th Birthday Amrutotsav, the sabha held in Sayla Ashram had swadhyays by Shree Kumarpal Desai, Param Pujya Gokulbhai and Acharya Chandanashriji. 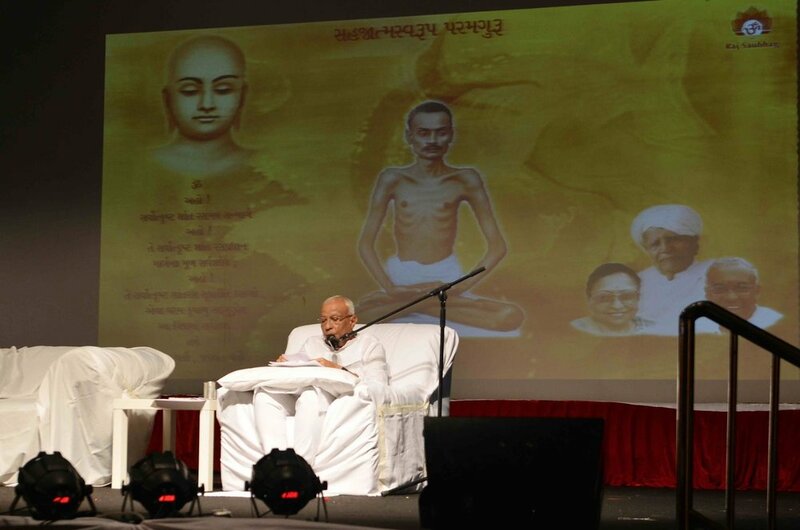 Param Pujya Rakeshbhai (Bapaji), Param Pujya Gokulbhai and Param Pujya Bhaishree’s swadhyay on the final day of the Amrutotsav, also the birth anniversary of Param Pujya Gurumaa, Shree Sadgunaben C U Shah. The community in Dubai, UAE, came together to celebrate Param Pujya Bhaishree’s Amrutotsav with the Tejovalay play on Friday 5th October 2018, hosted in the Indian Consulate and with the esteemed presence of Consul General Vipulbhai and many leaders of the Jain and Indian community. The Tejovalay play was met with rapturous applause, emotional tears and an inner awakening in many of the audience. For a seeker of truth, happiness and spiritual enlightenment, the practical questions being asked and explored in the play really connected within. You can listen to the Bruhad Alochana here. During the holy festival of Paryushan, we are inspired to reflect, seek forgiveness for transgressions and spend 8 days in quiet inner stillness. MI : Stands for gentle at heart. One should cultivate a tender and humble heart. DU : Stands for cursing one's soul for all the offenses that it has committed in the past. DAM : Stands for adopting equanimity and tranquility and thereby overcoming worldly existence. Guru Poonam is the exhilarating celebration of the divine presence of an enlightened Guru in our lives. Just as the full moon embellishes the night, Guru’s gracious refuge has bought meaningful luster into this worldly darkness. He removes the endemic ignorance that is prevalent and gives us the light of knowledge. Surrounded by ephemeral things, the blessing of having an unbroken lifeline must not go without being paid homage to. 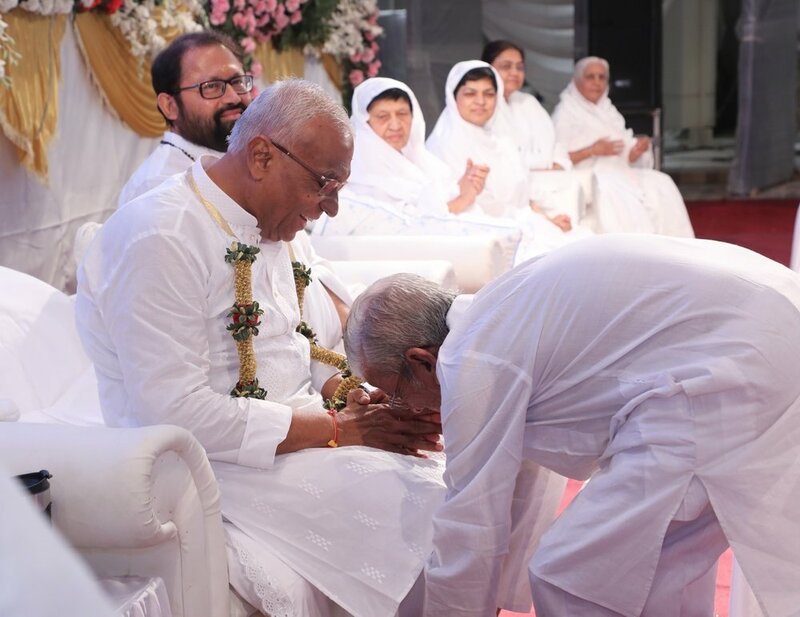 This year (2018), this purest festival of mentor-protégé lineage, was celebrated for 3 days in Ashram, 26th of July to 28th of July. From the outset, the ambience in the ashram had a seraphic overtone. Day one was scheduled to have swadhyaay and bhakti in the morning, darshan at P.P Bapuji’s birthplace (Chorvira) & visit to L.M.V school in the afternoon and cultural program in the evening. If for seekers like us, Bhaishree’s significance on this inward journey is immeasurable, we can only imagine what importance Bhaishree’s heart would hold for P.P. Bapuji who not only showed him the path but also whose grace helped him reach great heights of spirituality. Such is the glory of an enlightened Guru and it is a privilege to worship this pure soul. So, with buses and cars occupying around 100 mumukshus, P.P. Bhaishree and brahmanisths, all left for chorvira. On reaching Bapuji’s home, P.P. Bhaishree lit a candle in front of Bapuji’s portrait and bhakti songs were sung. Then the next stop was LMV School where 3 girls dedicated bhajan ‘Tu mane Bhagwan ek vardan aapi de’ to the Almighty, in Bhaishree’s presence and the humble Principal expressed gratitude towards Pujya Bapuji and Raj Saubhag Ashram and how their love for humanity feeds the hungry for knowledge minds and supports many vehement students. While the afternoon was filled with reverential feelings, the evening was as devotional as cultural. The very first presentation was that of a 30 minutes film made on P.P. Bhaishree’s UK Dharmayatra (20th May to 7th June, 2018). With pictures and videos capturing candid euphoria and devotion of London mumukshus, to background music providing lyrical form to their raw emotions, each frame of the film gave a glimpse of how overjoyed mumukshus were to welcome P.P. Bhaishree, the eagerness to hear his golden-wisdom filled words and being able to spend quality time in his divine presence and connect with him so closely, be it through swadhyaay or spiritual retreats or talks or insightful games. After the film, were beautiful solo and group dance performances, bhajan glorifying the importance of a true Guru and insightful play on Sulsa Sati and her virtues, through which mumukshus expressed their gratitude and vowed to completely and unconditionally surrender at guru’s lotus feet. Day two, the day of Guru Poonam, began early with Guru Welcome and Guru Ashirvachan, right after aagna-bhakti. Little later that morning, like every year was special dance performance by the students of Viklang Centre, card presentation by Dubai mumukshus and reading of gratitude filled messages from mumukshus from various parts of the globe. All requesting our Sadguru to help them get rid of the darkness and fill their lives with divine light. Later that evening was Bhakti by professionals who reflected the devotion of mumukshu’s heart through their songs and brought all gopis from tapping their feet to dancing in ecstasy with the devotion–filled heart. Another key feature of this festivity was 9 mumukshus, over the course of 2 days, sharing their close encounters with P.P Bhaishree. Each and every story shared, illuminated the raw depth of Bhaishree’s virtues, his modesty, humbleness, perception, sagacity, his unconditional love & care, precious grace and his profound understanding. How cannot one fall in love with such pristine true self? The next day, mumukshus had the privilege to hear Bhaishree’s swadhyaay in the morning as later that afternoon, P.P.Bhaishree and many other mumukshus departed for Amrutotsav celebration (Talk/Dance/Film/Play – Tejovalay) in Ahmedabad. 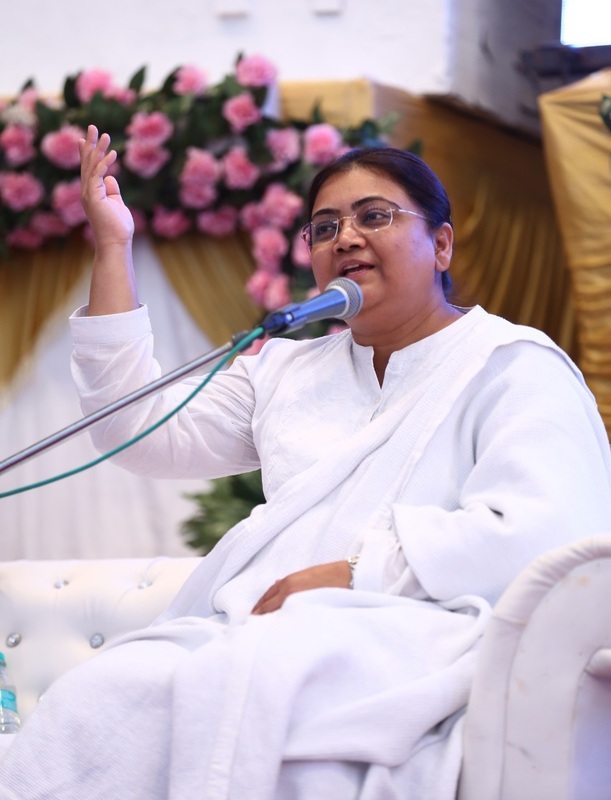 Over these three days, Bhaishree relentlessly elaborated on verse 98 of Aatmasiddhi and fervently focused on three pillars of spirituality all mumukshus must work on – Faith, Surrender and Devotion. Stronger the faith, deeper is one’s understanding; more pure your surrender, more humble you become and more devoted you will be, more virtues you shall develop. The biggest obstacle on this spiritual path is our ignorance. Thus, practice stillness, be more focused and observe peace. Actions and feelings go hand in hand. One ignites the other. Hence, re-direct your karma bhaav towards Moksh Bhaav. Do not hurry but do not be sluggish as well. Deepen your understanding and work single-mindedly towards your goal, Bhaishree says. Bhaishree’s Ashirvachan on Guru Poonam complemented the same ardor as his swadhayas. Even then, he reminded us of our blessings and made only one entreaty – The shortest road to liberation is ‘Ashray’ and ‘Bhakti’. Be reminded of your blessings and make sure you strengthen your enthusiasm, firmness and passion for this path and uncompromisingly stay devoted to the true enlightened master. Contemplate his compassion and unconditional universal love for each and every soul. Do not just sing the glory of HIS divine grace but ensure that you never forget this matchless shelter that we have acquired. By all means, bow and surrender at HIS lotus feet and completely engulf yourself with HIS purity and divinity. This is the best way to celebrate not only Guru Poonam but also each and every day of this otherwise misused life. There is no cause for spiritual welfare as powerful as association with an enlightened master (Vachnamrut, letter 375). As, it is only through HIS refuge are we going to overcome birth-death cycle and its sufferings. While most vaporize in the blink of an eye, bowing at HIS lotus feet with gratitude & Faith and holding onto that with steadfast devotion is our only escape from the fear of being caught up in this worldly mess. O soul! Awaken! Make the most of what you have received. “રાજમંદિર” એ પ.પૂ ભાઈશ્રીના હૃદયમાં રહેલો પરમ કૃપાળુ દેવ પ્રત્યેનો ઉત્કૃષ્ટ ભક્તિભાવ છે. મુમુક્ષુઓનાં કલ્યાણ અર્થે જે દાયકાઓ સુધી મદદરૂપ થવાનું છે તે અતિ સુંદર “રાજમંદિર” પૂર્ણ થવાના આરે છે. પરમ કૃપાળુ દેવની અત્યંત જીવંત પ્રતિમાજી ઘડાય અને તેનું અવલંબન પામી મુમુક્ષુઓ મોક્ષના માર્ગે વીતરાગ બનતા જાય એ ભાઈશ્રીનો પરમાર્થ મનોરથ છે. આપણે ભાગ્યશાળી છીએ કે બે વર્ષના અંતે દૂધ જેવો સફેદ આરસનો પથ્થર વિયેટનામની ખાણમાંથી મળી આવ્યો છે જેને તારીખ ૧૪-૬-૨૦૧૮ ના રોજ બહુમાનપૂર્વક, આનંદ ઉલ્હાસ સાથે વધાવી, આશ્રમના પ્રાંગણમાં સ્થાપવામાં આવ્યો છે. 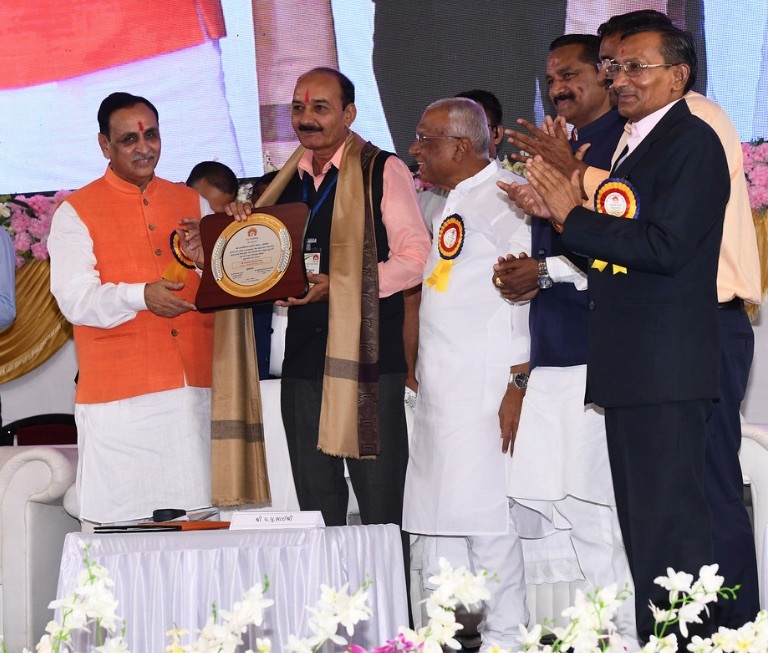 જોગાનુજોગ તે સમયે પ.પૂ. છોટાબાપુજી તેમજ પ.પૂ. બાપુજી સાથે જેમનો ઘનિષ્ઠ આધ્યાત્મિક સંબંધ હતો, તેવા ગચ્છાધિપતિ આચાર્ય માણેકસાગર સુરી મહારાજ સાહેબની પરંપરાના સાધુ ભગવંતો ગચ્છાધિપતિ પૂ. શ્રી ચન્દ્રસાગર મ.સા. (પૂ. 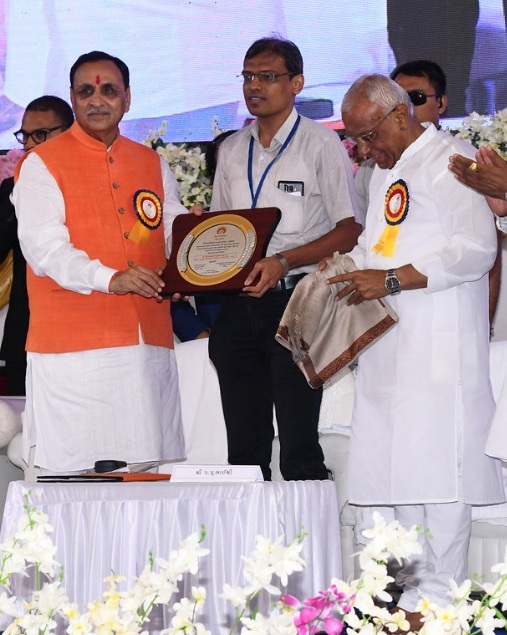 આગમોધ્ધારક સૂરિ) વિહાર કરતા આશ્રમમાં પધાર્યા હતા. 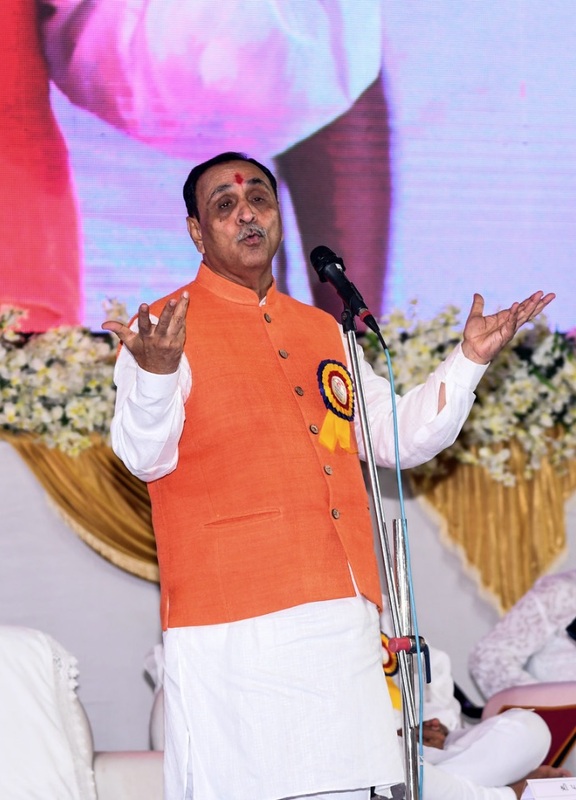 તેમણે અર્થપૂર્ણ પ્રવચન દ્વારા ઉત્તમ સમજણ આપી અને મંત્રોચ્ચાર દ્વારા તે એકેન્દ્રિય જીવોને ભાવપૂર્વક વિનંતી કરી કે, તેઓ કૃપા કરી મૂર્તિ કંડારવા માટે અનુમતિ આપે. આપણી ઉપર તે એકેન્દ્રિય જીવો અનુગ્રહ કરે તે માટે આપણે નાનો પણ સંકલ્પ કરવો જોઈએ એવી પ્રેરણા સાધુભગવંતોએ કરતાં ત્યાં ઉપસ્થિત મુમુક્ષુઓએ મૂર્તિ પૂર્ણપણે ઘડાય અને તેની પ્રતિષ્ઠા થાય ત્યાં સુધી પોતાની ઈચ્છા અનુસાર પ્રતિજ્ઞા લીધી હતી. ભલે આપણે ત્યાં હાજર ન હતાં પણ આપણે પણ આ વાંચી આપણી શક્તિ અનુસાર સંકલ્પ લેવો જોઈએ. ઓછામાં ઓછું રોજ, ૫ માળા સહજાત્મસ્વરૂપ પરમગુરુ અથવા તો નમસ્કાર મહામંત્રની ગણવી એવી ભલામણ આ પુણ્યાત્મક પ્રસંગે ભાઇશ્રીએ કરી છે. The catering team led by manager Jayesbhai is helping to provide for vegan diets. The catering in the Ashram is jain vegetarian, however an increasing number of our mumukshus are also vegan. There are many reasons for a vegan diet: animal welfare, health, climate change are to name a few. You can read about animal welfare in our maitri moves article by clicking here. Although the ashram cannot guarantee to provide for vegan diets at all times, it is making an effort to do so. When you arrive at the ashram please speak personally to Jayeshbhai (Kitchen Manager) in the kitchen and let him know you are vegan and the duration of your stay. His mobile number is +918264250982. Please ask for the khakhra without ghee. On most days breakfast is vegan. When there is upma then seperate vegan upma can be requested. Lunches usually consist of rotli, dal, rice, shak. There is rotlis without ghee on all days and you can request for rotla without ghee too. On days that there is kadhi and a dairy based shak they will make you an alternative. Jayeshbhai will ensure that there is a vegan shak available to you on all days. Dinner is usually lighter and mostly vegan. The kitchen will make you vegan idli and khichri without ghee on those relevant days, or a vegan alternative if there are other non vegan dishes on the menu. Jayeshbhai is also happy to order you soya milk from Rajkot and Ahmedabad. This is normally the sofit brand and costs approx Rs 110 - 120 per litre carton. You can order fruit from the ashram office. What is available depends on the season but the ashram staff will help you find what you need from Sayla town, and will often go and get it for you if they have time. Fruit is sometimes provided at lunchtimes. It is there daily during ekant maun shibirs, but at other times it depends on ashram members sponsoring the fruit. Depending on the number of people staying in the ashram this sponsorship may be from Rs 300 - 500 per day, so if you feel generous then you can sponsor fruit for the whole ashram. This is a new initiative and a learning process for the kitchen. They welcome feedback and encouragement and appreciate your positive feedback too. This is something that the kitchen team have done from their own initiative and very welcome to the vegans among us so thank you to the team. Please ask for clarification at meal times if you are unsure of ingrediants, Jayeshbhai is the person to ask and he understands veganism well. We would also recommend you keep some personal provisions in case you require them. Porridge, nuts, chocolate, fruit and dry snacks may be useful to keep. * Please note that the milk and ghee used in the Ashram is from the Ashram cows which are very well kept and looked after. Dairy products may be necessary for some poeple in their diets for health and the Ashram is not advising this diet over others as these decisions are a personal choice.